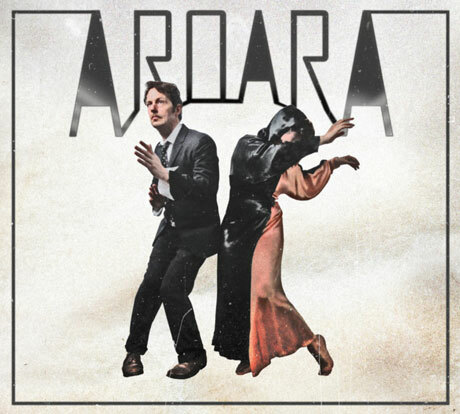 It's been almost two years since we caught wind of Andrew Whiteman's project AroarA, but the Broken Social Scene/Apostle of Hustle member and his wife Ariel Engle are finally ready to roll out their debut EP. In the Pines drops on March 12 through Club Roll Music (with distribution handled by Universal). The EP was recorded in various living rooms throughout the country, with mixing handled by Sandro Perri. The tunes are based on the work of American avant-garde poet Alice Notley. Her poetry book In the Pines contained 14 poems about being treated for Hepatitis C, so AroarA penned 14 corresponding songs; these tunes, including the five here, will eventually make up a full-length album, due out this summer. According to a press release, the EP is made of of "vocal duets, twin guitar lines and thundercloud drum machines," as the duo "play amplified cigar box guitars and use a 404 sampler to trigger mellotrons and Black Sabbath bells." Preview what this sounds like by streaming the avant-folk cuts "#5" and #2" down below. AroarA are touring Canada in the coming weeks in support of Martha Wainwright. Scroll past In the Pines' tracklist to see the schedule.